The city of Tampa, FL will be invaded by pirates on Saturday, January 29th when it holds its annual Gasparilla Pirate Fest. Pirates will enter Hillsborough Bay at 11:30am in the world's only tall-masted and fully-rigged pirate ship. Constructed in 1954, the ship is a replica of a West Indiaman used in the 18th century, and it measures 165' long by 35' across the beam, with three steel masts standing 100 feet tall. 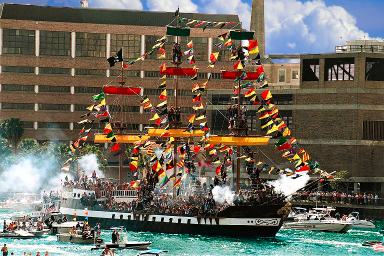 The ship will be flying its flags and shooting its cannons to kick off the celebration and let everyone know that the pirates have arrived! The bay is a sight to behold with a multitude of pleasure crafts meeting the ship to defend the city, but then quickly changing their minds and siding with the pirate's crew. This "invasion" is a re-enactment of the historic pirate invasion of Tampa that was led by the infamous pirate, Jose Gasparilla. The pirate ship and its fleet will then head up Seddon Channel towards downtown Tampa. The pirate ship will dock at the Tampa Convention Center around 1pm, where the Mayor of Tampa will surrender the key to the city to the Captain of Ye Mystic Krewe of Gasparilla. Afterwards, the party begins on the street of Bayshore Boulevard, where the pirates will celebrate their victory with a parade. The krewes throw beads, coins and other items while shooting blank pistols from floats. This festival has been going on since the early 1900's, so downtown Tampa has had a lot of practice in creating an awesome pirate fest. The festival, with over 400,000 people in attendance, will go on long after the parade and into the night. There will be live music, "pirate" entertainment, and plenty of food and grog! If you want to party like a pirate, Gasparilla Pirate Fest is the place to be!